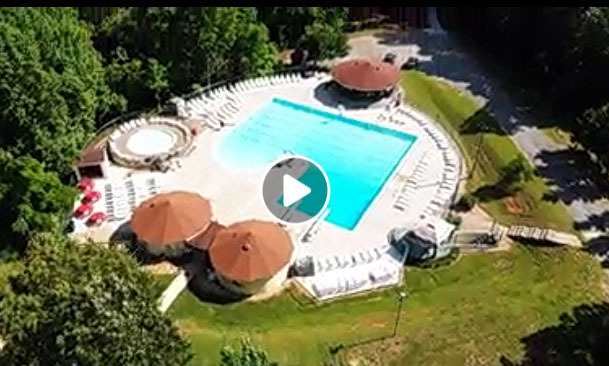 Wildwood Area Recreation Association (WARA), located just off 460 in the Wildwood Subdivision in Lynchburg, Virginia, is a private pool along with tennis courts, 3 lakes for fishing and more. Best known for its pool privately secluded by trees and three surrounding lakes, membership also includes year round use of three tennis courts, a full-size sand volleyball court 3 lakes and more. The original pool was built in 1979. In 2016, the liner and tile for the large pool and baby pool were renovated back to its original state. The large pool holds approximately 200,000 gallons of water while the baby pool holds approximately 2,300 gallons of water. We are a fully stocked-owned pool. All of our members must own at least one share of stock and pay annual dues. Our By-Laws limit our active membership to 300 family members and 20 single memberships each year. Sunday: 12:00 Noon to 8 p.m.
Click the Photo to Watch a Video of our Beautiful Pool and Lakes!